Paper is cut then sewn in bundles. 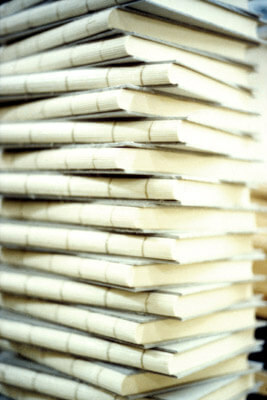 After trimming the paper edges, the sewn spines are glued and rounded by light hammer blows. The sewn threads are then fixed solidly on a cover of card. Then we dress this card cover with the desired finish of leather or imitation leather, stretching it to form a perfect finish. The inside covers are then laid with paper in order to form a visually pleasing finish and offer a smooth fold. Finally, the leather cover is delicately and naturally treated, using egg-white, to moisturise and nurture the leather. This offers a handsome and rich finish.